Yesterday 22 others and I boarded the plane for JFK and at midnight boarded the flight for Tel Aviv. 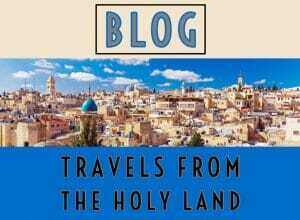 While in the Holy Land I’ll be keeping a combination of written and video blog. You can find those on the West website and/or the Headingwest app. Most importantly, while in Jerusalem we will be visiting the Western Wall of the temple. It is tradition to bring prayer concerns to the Western Wall. Compliments of Wikipedia . . . The Western Wall, Wailing Wall, is an ancient limestone wall in the Old City of Jerusalem. The wall was originally erected as part of the expansion of the Second Jewish Temple begun by Herod the Great, which resulted in the encasement natural, steep hill known to Jews and Christians as the Temple Mount, in a large rectangular structure topped by a huge flat platform, thus creating more space for the Temple itself and its auxiliary buildings. The Western Wall is considered holy due to its connection to the Temple Mount. Because of the Temple Mount entry restrictions, the Wall is the holiest place where Jews are permitted to pray, though the holiest site in the Jewish faith lies behind it. I am happy to pray for you and your concerns at the wall! Email me those concerns if you’d like. I look forward to sharing this journey with you in the days ahead.